Why did Matthew write this book? "This book will completely change the way you look at life"
"Just finished reading about the sun and moon. You've awakened me"
"Your book is very interesting. Congratulations"
"Matthew Silverstone's brain thinks outside the box"
"Impressive logic and provocative ideas... Original and interesting"
The real beginning for me, the initial seed of an idea for this book, bizarrely came from a tree. I am sure I have a pretty average knowledge of trees amongst a generation of other city dwellers.I can recognise some trees, but very few of them. I know they grow leaves in the Spring which fall off in the Autumn. I believe I have discovered a great missing part of the scientific jigsaw that provides a new and very simple unifying theory. The piece of the puzzle that seems to have been ignored for so long is this simple fact, everything vibrates. Water is the missing link that can provide the answers to many of the unknown questions in science. It can remarkably explain why the person next to you can affect your mood and why the plants in your house are as emotionally attached to you as your pet dog. It is true that the moon and the sun do affect us physically. In fact all of the planets affect our biological make up, affecting such things as the thyroid gland, our sleep patterns, the growth cycle of trees and even how often dogs attack us. Magnetic forces affect all living organisms both positively and negatively. They can cause major illness such as diabetes, chronic fatigue and hay fever but also, if used correctly, help to solve the world food shortages by increasing plant growth. The decline in the bee population is a catastrophe. I managed to find a solution to the problem without having received any funding, a solution that would cost virtually nothing to put in place and could possibly eradicate entirely the disappearance of bees! Are the benefits of our technology really worth the damage they are doing to our health? The growth in the use of mobile phones and wi-fi have been shown to have a direct link to biological changes and the increase of immune related illnesses worldwide. An unrecognised Indian genius whose scientific ideas are so important to our basic understanding of how living organisms behave that it really beggars belief that Bose has not been given the fame he deserves. If you want to know how plants and animals behave at the most fundamental level you have to read this chapter. This chapter will completely change the way you look at plants. How could it be possible that plants, with no central nervous system can not only recognise emotions in a human but also alleviate illnesses such as attention deficit disorder. 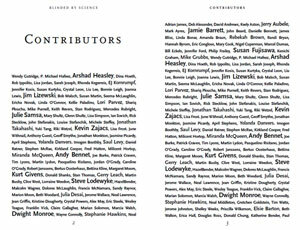 The complete bibliography of 34 pages listing all of the articles that were used as the basis for the book. All rights reserved. No part of this publication may be reproduced, stored in a retrieval system, or transmitted, in any form or by any means, without the prior permission in writing from the author, nor be otherwise circulated in any form of binding or cover other than that in which it is published and without a similar condition including this condition being imposed on the subsequent purchaser. Being part of such a great experience as writing a book has not been available to everyone. Until now. Matthew Silverstone started to write this book almost 2 years ago. He is very close to finishing it and now needs your help to do just that. You can now be the co-author of a real book. 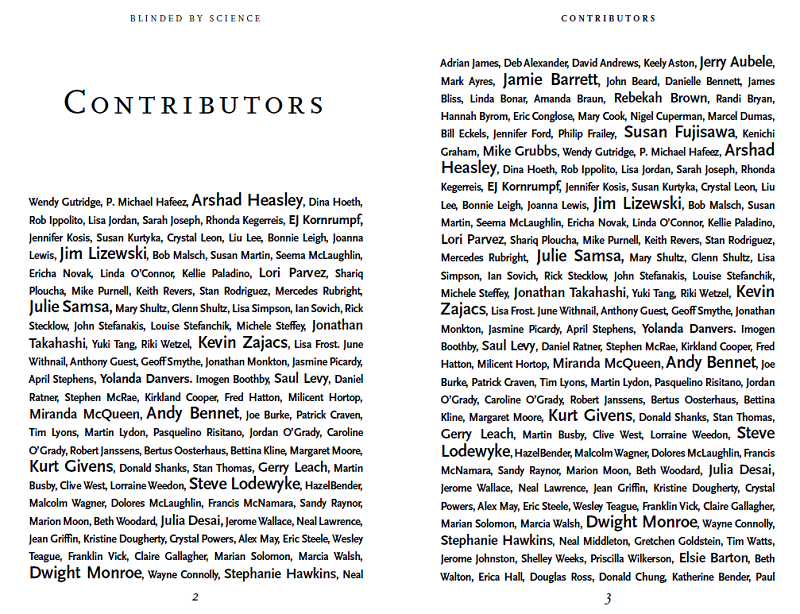 And the best part is that your name can be in the final printed version. 2. Comment. Make useful comments about the chapter you have just read, start a new topic or just get involved with existing discussions created by other people. Any idea that you have can generate a debate. Any idea can generate new ideas. Any new idea you have can generate a new sentence, paragraph, section or even a chapter in the book. 3. Work with us. Choose a book cover or create a new one. Suggest a new title for the book, or sub title. Everyone will help vote for the best one for the book. Get involved as your opinion counts. Provide us with ideas about how to promote Blinded by Science. If you know an individual or organization who might want to get involved, let them know. When you participate you will be able to understand how it feels to write a book. You will be able to share your concepts and ideas with other readers, with people who are interested in the same things you are. You will receive honest feedback about your thoughts. This is what it takes to create a book! And in the end, your name will appear in the book. How cool is that? Book 2.0 describes a new trend in writing books. Just like Web 2.0 changed the way people communicate on the Internet, Book 2.0 will revolutionize the way books are written. For the first time, people interact to write, design and promote a book. Anyone who has a good idea and wants to share it on our website can have his name printed on the final version in the book. The more you get involved, the more chances you got to generate a new chapter in the book and have your name written on it. How do I know if I'll be in the book? People who comment and give us ideas on the website could have their name written in a generated cloud. The cloud includes users who review the chapters, help with promoting our book or propose a design for the book . The more you get involved, your name will appear larger in the cloud of names. Matthew will choose those people whose involvement on the website made a difference and put them in the final printed version of the book. Matthew and I became friends about 10 years ago. He lives in London and was looking to employ a web designer, and through a common friend, was put in touch with me. I live in Romania. We used to communicate regularly via Skype, every day we would talk about the projects we were developing together. However, all of this gradually stopped when his teenage son got ill. Matthew had to stop work to look after his son and our weekly chats became more and more spasmodic. I had noticed deterioration in his tone on our occasional chats, his happy go lucky attitude had all but disappeared. He would occasionally talk to me and let me know how bad the situation had become and that the doctors had no cure. He kept on telling me that life was at a standstill for him, all of his energy went into looking after his son. I didn't know his son at that time, but Matthew is such a passionate man that hearing him sounding so hopeless his hopelessness made me feel angry at the world of medicine. Why could they not do anything? Why could they not even explain or understand what was wrong with his son? One day Matthew told me he had met a man, I don't know how he got in contact with him, a guy that he described to me as someone "who does weird stuff". It was his way of saying that this man that he met was practicing what we all know as extremely alternative. He didn't tell me exactly what the treatment was because he knew that as he didn't believe in it why other people would. Most of us can't believe in something that we can't touch, or see, or prove. This man gave him a simple explanation of the problem. His son was like a car with a flat battery, no matter how much you fine-tuned the engine or fed it superior petrol the car would not start. His son was unable to fight with the illness because it had no energy to do so. It's hard for a rational man, like me or Matthew to believe such an explanation and to accept that the solution was to take energy from the air and put it into his son. But what did Matthew have to lose. He had tried everything else, so he agreed to pay for a series of wacky treatments. The thing is that in 6 months, his son got better, and now, after two years, I had the chance to meet him in person and see that he is completely healed, he has re-started his life and has turned into a very nice and happy person. That recovery made Matthew start asking questions about how was it all possible, why didn't the doctors know about this solution and was there any scientific studies that could help him to understand the process by which it all worked. As there was nobody there to answer his questions he started to look for the answers himself in the British Library. This was typical of him. So for the last year and a half the British Library was his second home. What was lovely was that his happy personality came back and he began chatting with me again on Skype. He would often recount amazing things that he had discovered that day whist at the library, ideas that I found incredible. I am going to recount to you some of the things he discovered whilst he was researching the book. One of the first things he told me was about tree-hugging! You probably know that around the world there are people that hug trees. Of course most of us think that it is just a hippy thing. I don't anymore because Matthew explained the science behind it. He told me a simple fact, EVERYTHING VIBRATES in the universe, molecules, water, everything. Combining this fact with the amazing properties of water, which he explained is a chameleon, it changes its vibration all of the time. He suggested that as the human body is made up of 70% of water and water is also found in trees… apparently the water vibration in the trees when you put your body next to the tree, that vibration is transmitted to the water in your body and that makes you feel better, calmer… IT'S THAT SIMPLE! And it's amazing how many things you can explain starting from this simple TRUTH. It is all about vibrations and water. Another amazing thing Matthew told me about was at the beginning of his research, the collapse of the bee population. All over the world there is a big problem these days, bees are disappearing. We all know that without bees, there will be no plants, and of course no humans pretty soon after that. Apparently bees are homing creatures and this ability to find their way home is disturbed by the multitude of GSM networks, satellites and all sorts of man-made electromagnetic fields that surround the Earth. Did you know that if you move a BEE HIVE one meter to the left, when the bees return they don't know how to find it? They will all land on the floor of the previous location of the hive and die. I didn't! This is what the book is about. It provides amazing new ideas about so many unexplained phenomena, things that are talked about but not explained. That's why Matthew called the book "Blinded by science". The best thing about the book is that IT MAKES YOU THINK. It makes you find your own answers to things that you never expected to figure out. The book just gets you started in discovering things that you had never considered before. I assure you that once you have read just one chapter you will start to bombard all your friends with stories and embellish these with your own ideas, your own explanation about new ideas. I know this will happen to you because it happened to me, it happened to the designer who designed the book covers, it happened to all my friends, in fact it has happened to everyone who has read at least one chapter from the book. It will happen to you too! Matthew Silverstone is a serial entrepreneur. He has a degree in economics and a masters degree in international business. He was as one of the youngest executive producers of his generation within the film industry, at aged only 22, whereby he attempted to raise finance for major feature films. He moved on to developing musical talent and helping to develop the careers of budding artists. Having attempted and failed to make his millions before he was 25 he decided to work within less glamorous sectors of business and developed successful companies within the cleaning, building, property development, childcare and transport sectors. His career came to a halt midway through the launch of a major internet social network site due to the illness of his son, for whom he became a full time carer. It was watching the lack of medical help from the established sectors of science that led him to start questioning everything that he had been told about science. He comes from a very traditional medical background, both his brother and father are Professors of medicine, so it was not easy for him to shed off his traditional medical ideas and start questioning the very foundation of these concepts. Once he started to do so, and found that the answers to the questions were not what he thought, he started to treat the whole idea as if it were a new business and spent two years researching and developing the ideas behind Blinded By Science. His son has since made a full recovery and this book helps to explain many of the ideas why doctors will never find cures for some of the major illnesses that are affecting society today. Please log in or register to order the book ! Would you like to vote for this cover ? You have to login in order to vote!